How were the rules in the previous version of Kill Team? The version that came with Deathwatch vs Tau? Were they just regular 40k rules with some modifications, or were they entirely different? Also, props to GW for using Stygies troops in the reveal video. Now if only we could get a damn Stygies transfer sheet. Sounds interesting, especially with rules that are not tied to 8th edition. I'll be eager to see if it competes for my attention with the skirmish version of Grimdark Future (used to be One Page 40k) from One Page Rules, because that game has seen decent interests with my buddies who are only casual gamers. The best part about this is the potential where if it uses unique rules from 8th edition, I would be able to own several different Kill Teams from various races without having to shell out all the pretty tremendous costs for not only the 8th edition rules, but all those various codexes, as I don't have any reason to own 8th edition rules material in my area. I have been wanting skirmish rules for 40k stuff, but the requirement for full-on codex purchases has kept me away from things like the BoS Kill Team rules from last edition, as I own 6 distinct armies for 40k from years past, but with no call for full-on army scale games from who I hang out with, 75% of any up to date codex is wasted cost for me, multiplied by 6. Pity, I hoped for something like Shadespire (as in, new kill team models, or if they were going to use existing sprues, largely pre-defined, balanced teams from one troops box, with more in-depth rules), not something that looks like Shadow War 2.0. Maybe I am getting old but I prefer Shadespire cards than constantly cross-referencing rulebook for possible actions. Also, the 'dozens of factions' claim is weird. Like what? Are we going to get rules for every single named SM chapter? Basically 7th edition 40k with one big change: each model acted as its own unit. Then they updated rules for morale and leaders / specialists. Game was fun, tho competitive events were dominated by Tomb Blades. The WH Community article says this new Kill Team will have its own stand-alone ruleset. Looking at the stratagems, it sure looks like models will alternate activation, a staple of all good skirmish games. What. Is. This. New. Terrain??? Mostly the same core rules with some additions (every model a unit onto itself etc.) and restrictions as to what you could or could not field, like tanks and models with a 2+ armour save. Yeah, 7th edition Kill Team was essentially an updated 4th edition Kill Team, which was in itself a great rules variant. I think other than what will likely be the traditional GW pricetag for the buildings, they look great. The preview showed Grey knights so I'd say the chances of every current 40k faction bar Knights and Ynnari being in the game in some form are good. Assuming it stays relatively similar to previous Kill-Team, expect there to be a cap on Wounds and Armor Saves, along with leaving out Monster/Vehicles. It'll be fun to dig out my Tempestus Scions again, they started out as a small task force for the last edition of Kill Team. That was not Deathwatch, that was just old SM squad box painted in Raven Guard colours. And yeah, was mostly using cut down 5th edition rules. You used models from your 40K army adding up to 200 points, 3 models were granted special rule of your choice, every model was IC, it's pretty much it. Which is why I find the reveal underwhelming, it was really Listbuilding : The Game, where factions with more efficient troop choices won by pretty much default. Elites, like Sternguard, sucked, because they were nowhere near killy enough to deal with disadvantage in numbers, and the game pretty much consisted of spamming of basic troops with most cost effective gun possible. So I can possibly field a whole *TWO* Custodes as a Kill Team? Sounds about right. Actually that might be kinda fun. They do show a couple of Thunderwolves, so some larger models will be possible (fingers crossed for Necron Canoptek Wraiths and Spyders). Subject: Warhammer 40K - The Return of Killteam? The terrain looks a lot like they just painted the old Pegasus Hobbies modular cathedral walls white. They are not that good. They are poorly designed. The ruined Pegasus cathedral bits are pretty great, I love mine. I wonder if this will use the Necromunda rules? IIRC, you could run Thunder Wolves before. I'm redownloading my copy of the previous ones to check. -Could not contain vehicles. Had to include at least four models in a Kill Team. 0-2 Troops, 0-1 Elite, 0-1 Fast Attack choices. -Could not have more than 3 Wounds or Hull Points on their profile. -Could not have combined Armour Value of more than 33 on vehicles. As long as you met those criteria, you were a-ok. YES Mymearan, GW can do NO RIGHT. Pegasus Hobbies invented gothic cathedrals. GW, in an evil quest to destroy poor Pegasus Hobbies, has actually invaded their factory, TAKEN PEGASUS' PLASTIC TOOLS, and then RETOOLED their steel molds! 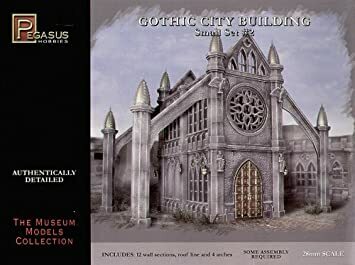 GW is SOOO evil that all they could do for THEIR gothic terrain was "a slight retooling of the Pegasus Hobbies cathedral." It was about time this happend. Really looking forward towards new skirmishes in the dark millenium. GW will have to put a lot of effort in it to reach the quality of the heralds of ruin Killteam rules. At least in 7th they totally failed with that. Looks like it will be a big book. At least 204 pages. Specialists have a skill tree and can reach up to level 4. There is a scouting phase. If your opponent is not a scatterbrain or an donkey-cave, a game could easily be played in 30 minutes or less. Thanks - then I guess I am sold! Actual proper new rules that might get a bit closer to representing the gap between different units, and new modular terrain? SOLD. But not sold yet, too many failures betwixt announcement and release to commit that much enthusiasm yet. I spy d10s on that board. How radical a departure are we really on? Ha ha. I was thinking the same thing. Easy painting tonight! I am optimistic. Not just cautiously optimistic, but plain old optimistic.